This atmospheric 2D adventure takes you through the lands of Perm Chud tribes as you explore the three layers of the universe, starting with the Lower World where the dead reside. Does this dive into a unique culture’s mythology offer entertainment and education alike? Let’s find out. I’m the kind of person who wants a strong story from my games first and foremost. If the game can teach me something or enhance my understanding of the world, I’m all for that as well. The Mooseman seeks to do both these things by taking the player through a journey that is wholly inspired by the mythology, artifacts, and writings of the Perm Chud tribes. You play as a silent shaman, a Mooseman who has the ability to see beyond the world we inhabit and into the world of spirits. Your journey will take you through three layers of the universe, starting with the lower world and working your way through. The Mooseman is a game that moves at a slow and steady pace, save for moments where you’re running from a threat or engaging in a boss fight. Between these moments, you must navigate simple puzzles and navigational threats. Before we dive deeper into the gameplay, let’s start with how the story is conveyed. The Mooseman uses a narrator who speaks in the native language, and a variety of collectibles and written passages to enhance and expand on the world around you. They’re also short enough and spaced out to the point where you won’t spend too much time in menus. As you pass totems in the world, new passages unlock that tell stories of the world’s creation, and the backstory of spirits you will encounter, some of which will be friendly, and others not so much. In this way, The Mooseman offers a haunting and atmospheric journey peppered with the mythology of tribes that have probably never enjoyed the mainstream exposure it deserves. This kind of folklore is often lost to the folds of history, so for a game to immortalize it in such a way is a testament to the power of this medium. As you play through the game, you’ll use your power to shift between realms and expose new paths forward or solve puzzles to help you progress. Later in the journey, you’ll also obtain a temporary barrier you can trigger to deflect enemy attacks. The adventure is also peppered with some set-piece moments and boss fights. Overall, it’s not incredibly long as you’ll probably finish it in a few hours, but the collectibles and the rich lore behind everything warrants additional playthroughs to truly grasp the massive scope and scale of this mythology. I didn’t really have any issues with the gameplay, other than the fact that your movement is quite slow and the controls aren’t incredibly responsive. This only became an issue later in the game when I failed or was killed as a result of the somewhat sluggish movement. 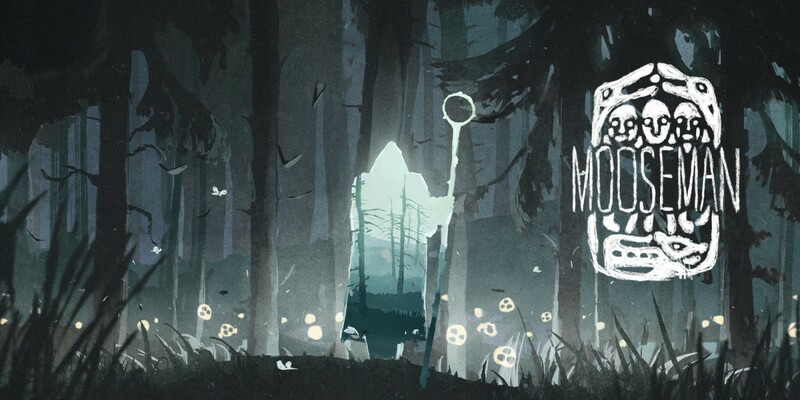 The Mooseman manages to combine a haunting journey with enough engagement and gameplay to keep things interesting throughout, while also teaching the player a lot about a lesser-known mythology that deserves to see the light of day. If you’ve played other titles based on mythology like Mulaka or Never Alone, you should absolutely give The Mooseman a look. The Mooseman employs a hand-drawn art style that looks incredible in motion. The jagged lines and sharp edges mix wonderfully with softer backgrounds and detailed animations. Simply watching the purposeful gait of the Mooseman himself is mesmerizing. When you switch to the realm of the dead, the skull of a moose appears on the shaman’s head. You’ll also spot the faces of floating spirits, and later in the game, you’ll come across some pretty terrifying bosses that fill the screen with a haunting presence. The sense of place and atmosphere in The Mooseman is one of its strongest qualities. It won’t grab you with jump scares, but it will keep you on edge as you navigate the dark corners of this universe. This is an easy game to recommend to those who enjoy atmospheric adventures and deep dives into smaller and lesser-known mythologies from around the world. Even those who typically don’t play games like these will find plenty to like in the puzzles and boss fights. We need more games like this to show the power of gaming as a means of immortalizing and capturing the stories in our world that would otherwise go untold. If the concept and style catch your eye, you should absolutely give The Mooseman a try.